Ferroconcrete & prestressed structures condition is affected by many factors. One of the most negative factors is reinforcement corrosion. At present time, CDV - Transport Research Centre and Physical Department of School of Civil Engineering at Brno University of Technology are dealing with development of a diagnostic method based on the principle of acoustic emission. This method should be used for structural defects monitoring of ferroconcrete and prestressed structures, especially bridges, where defects were caused by reinforcement corrosion. In this paper, a measurement carried out on the occasion of the 7-012 Brandysek bridge reconstruction is described. The bridge is located at R7 expressway between Prague and Slany. 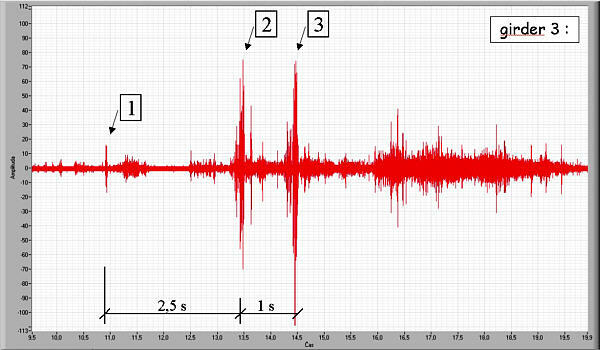 The SoundPrint system using the AE method for continual monitoring of constructions and possibilities to use Impact-Echo method for similar purposes are also described. 1 "Acoustic Emission" and "Impact Echo"
Mechanical energy appears whenever any object or construction is stressed. The energy is emitted in the form of elastic waves. This phenomenon is generally called Acoustic Emission (AE). Normally operated bridges constructions are affected by dynamic actions caused by transport, wind etc. That gives rise to the acoustic emission. The research is trying to find the characteristic frequencies ("unhealthy sound") which are generated by corroded prestressed and possibly also by the soft reinforcement in bridges when stressed. At the same time it aims to determine the extent and location of the reinforcement corrosion affect. The main difference of these two methods is as follows: AE method measures the activity of acoustic emissions caused by changes arising inside a construction, while the Impact-Echo method is based on monitoring the waves created by a shock which does not cause any inner changes. The measuring is based on continual monitoring of constructions. Then the AE signals produced by the wire-breaks are recorded. A set of piezoelectric sensors (see figure 1) is used for the measuring. They are placed on the tested construction, e.g. on a prestressed beam, on a bridge ceiling, etc. The sensors are connected to a system unit that collects data. The unit, together with a central computer, is usually placed near the measured construction (a bridge). The computer, together with the unit, automatically carries out primary data filtering, removing from the recorded signal those acoustic events, which do not directly correspond with the measured phenomenon (noises, sounds caused by passing vehicles, wind etc.). The filtered information is then sent through a modem connected to internet to the Processing Centre in Calgary, Canada. With the help of an analytic software, every event with the located point where it occurred in the construction is evaluated. The results are available for customers on a website. The sensors on the construction must be placed in such order so that their range would cover the whole tested area. In case of a wire defect, data from three sensors are sufficient to locate the point where the defect occurred. Processing software compares combined information from all sensors that recorded the defect and locates the point with tolerance of ± 0.5 m.
An example of the above described method in Europe is the post-tensioned bridge in Huntingdon (England), see figure 2. 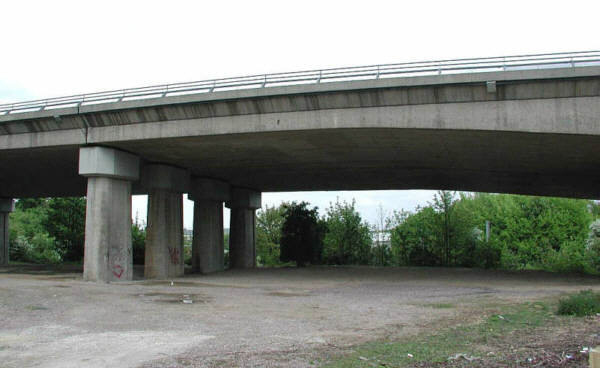 The six-bay Huntingdon expressway bridge spans over a local road, a car park and a railway track at the station. 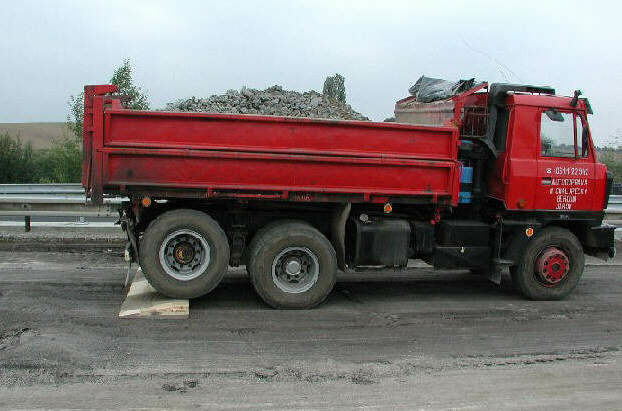 Pure Technologies Ltd. have been carrying out measurements for Highway Agency since 1998. The important advantage of the system is the fact that the sensors need not be directly connected to a reinforcement, which is very often inaccessible. The data are acquired in a real time. In emergency situations, that allows to take security measures virtually immediately followed by a subsequent action. The device is fully automatic with only regular checks. The main drawback of the system is high purchase cost and use only for one monitored construction for a longer period of time, which substantially decreases its usability for other constructions. 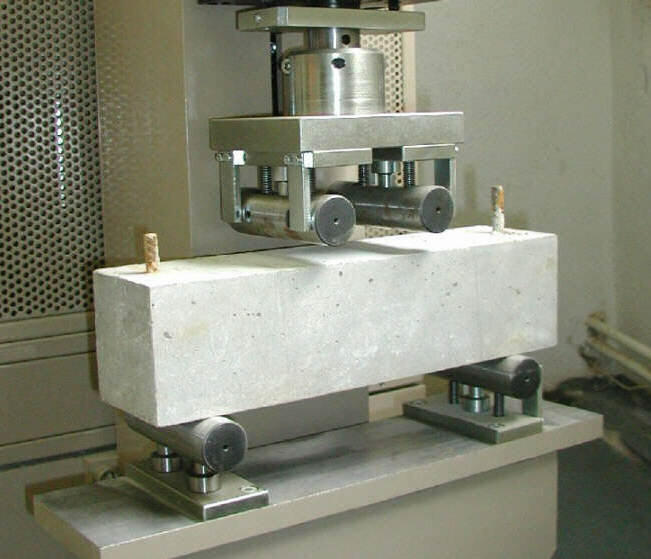 The aim of our research is a proposal and methodology verification for preparation and taking measurement of defects of steel reinforcement at ferroconcrete and prestressed constructions with a use of a method of acoustic emission. One-time measurements will be carried out with a help of mobile equipment. The proposed measurement system is supposed to allow repeated measurements of more constructions because it is not fixed at a single construction for a longer period of time. The results and conclusions will form a base for the proposal of monitoring, repair and maintenance of road bridges made from ferroconcrete and prestressed concrete. Fig 3: Two channels measuring equipment. The measurement was carried out with a help of specially assembled measuring equipment (at this moment only of two-channel system). This configuration is sufficient to analyse the AE properties in this phase of the research. In the final phase, when a defect is localized, the configuration will be extended up to 4 or more channels. At the moment, the measuring equipment consists of a computer fitted with NI 5112 measuring card. This card allows to sample recorded signal of a frequence up to 100 MHz. The other parts of the equipment are connected by coaxial cables (amplifiers, preamplifiers and broadband piezoelectrical sensors with frequency range up to 1 MHz). The measuring equipment is shown in figure 3. 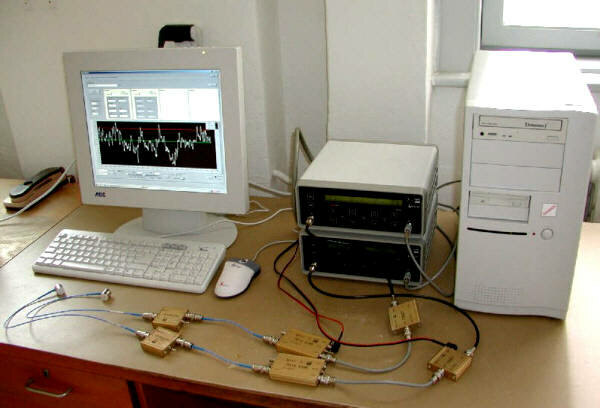 Laboratory measurements in 2002 were aimed to study an acoustic signal with reinforcement corrosion correlation. 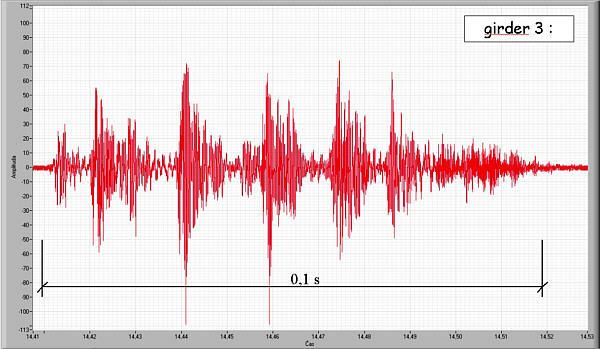 The response signal to actuating pulse and AE signals recorded during the time when the samples were exposed to bending tension were analysed. Fig 4: Frequency spectra comparison. In the second phase, the samples exposed to accelerated corrosion were repeatedly monitored. Again, the response of these samples on the actuated pulse was processed. The response was recorded simultaneously on the reinforcement and on the concrete surface of the sample. With increasing corrosion, in the frequency spectrum marked frequency components shift into lower frequency areas. Frequency components of around 100 MHz are muffled. Fig 5: Bending tension test. In the third phase, two sets of reinforced beams were monitored. One set aged in laboratory conditions while the other in an agressive corrosive environment. Tested beams were repeatedly exposed to bending tensions according to EN 12390-5, see figure 5. Frequency spectra of the acoustic emission and the pulse frequency rate were processed. The laboratory measurements proved correlation of changes in frequency spectra with structural changes caused by reinforcement corrosion. Satisfactory correlation was reached especially in the case of monitoring the proceeding corrosion by repeated sample measurements. After we verified the possibility to detect corrosion of ferroconcrete reinforcement in laboratory conditions we started measurements in situ. During the reconstruction of 20-year old bridge, 7-012 Brandysek, I73 bridge beams (precasted-prestressed I-beam) were tested by an acoustic emission method. The bridge consisted of three bays with 9 plainly placed, 30 m long I73 beams. Consecutively, when the beams were demolished, a condition of single cables in prestressed and construction reinforcement were checked. The aim was to check a possibility for using the AE method to find out the beams condition of this type. At the time in which the measurements were carried out only two outer bays (out of the total three) were accessible. The bridge profile is depicted in figure 6. Fig 6: Brandysek bridge profile. Eighteen I 73 beams were measured with the AE method. Sensors to record AE signals were placed at the bottom of each beam and in the middle of their outspan. AE signals were generated by a Tatra lorry travelling over a 15 cm high wooden bar. The bar was placed on the road surface exactly above the point of measurement. The sensors were placed with a use of a lifting platform and the measuring system was powerd by a generator. The use of the platform is shown in figure 7, AE signals generated by a lorry travelling over an wooden bar is shown in figure 8. Before each measurement, the wooden bar was placed in such a way so that a lorry wheel would hit the road surface as close to the sensors as possible. During the whole time of the lorry travelling over the bar AE signal was continually recorded (approx. 15 seconds). Sampling frequency was selected at 1 MHz. Each beam was measured repeatedly, three times. This was the measurement process of eighteen I73 beams in two bays of the bridge. Fig 7: Sensors placement process. Fig 8: Lorry travelling over the bar. Even before our measurement a decision was taken that the existing I73 beams would be removed and replaced with steel beams. The beams demolition was carried out on the spot with a help of a pneumatic hammer and hydraulic cutting shears. With the help of this equipment the concrete was broken, construction and prestressed reinforcement separated and taken away to be recycled. During this process we had the unique opportunity to find out the condition of the reinforcement. A visual examination was carried out both at the point of measurement and also along the whole lenght of the beam including the anchors and Sandrik steel pipes. 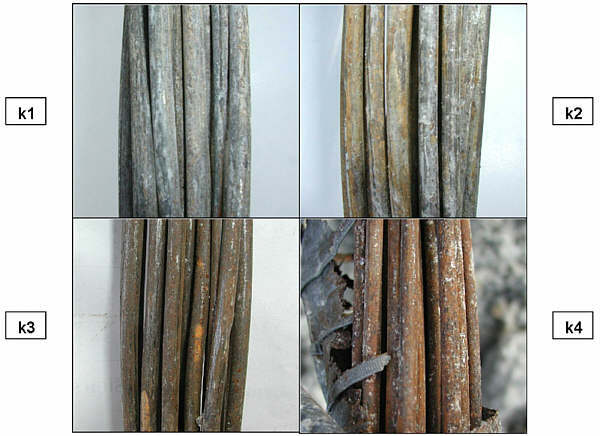 The examination was aimed above all on prestressed reinforcement consisting of 20-wire cables of 4.5 mm in diameter. Fig 9: Four groups of corrosion. There was no significant effect of corrosion on the reinforcement section. For the evaluating purposes, the corrosive attack extent was divided into 4 groups (k1 up to k4). The reinforcement basally untouched by corrosion was put into the first group k1. The reinforcement located close to the anchors, which was affected by corrosion layer of the 0.5 mm thickness and with initial signs of penetrating corrosion was placed into the fourth group k4, see figure 9. For processing the AE signals, we used software (on the basis of LabVIEW system) adjusted according to our requirements. FFT (Fast Fourier Transformation) was used to transform the signal time behaviour into the frequency spectrum. One channel helped to acquire the data for further evaluation while the other channel had only supervisory function. 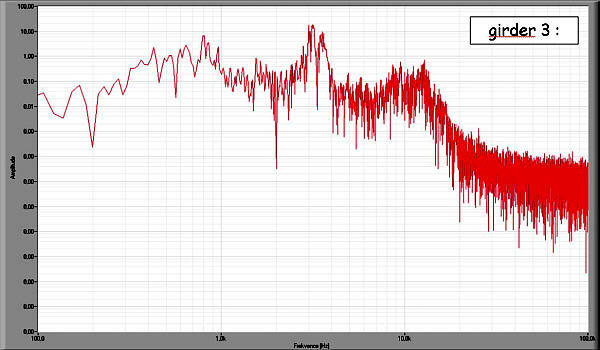 The typical recorded signal time behaviour is shown in figure 10. The arrows indicate events occurred as the each lorry wheel hit the road surface. The arrow 1 corresponds with the front axle, the arrows 2 and 3 correspond with the 2 wheels of the rear axle. The time periods corresponding with the second and third wheel landing were selected to analyze signals of other beams because the signal amplitude reached the highest value. In figure 11, there is a time period shown during which the second wheel of the rear axle hit the road surface, and figure 12 shows the corresponding frequency spectrum. There were found no significant differences when all frequency spectra, in a range between 100 Hz and 500 kHz, were compared. In the scope of performed measurements, no frequency was found that would indicate some significant construction defect caused by the reinforcement corrosion. That corresponds with the visual examination of the reinforcement at the points of measurement, during each beam demolition, which proved that both the prestressed and the construction reinforcement were in suitable condition concerning the corrosion. Fig 10: Overall time progress of the signal. Fig 11: Wheel 2 - time progress. Fig 12: Wheel 2 - frequency spectrum. The significant advantage of the AE method is the fact that it indicates only the defects which are active at the given stress of an equipment or construction and thus they are unstable and dangerous. Compared with the common non-destructive diagnostic methods it can give us global information about the examined object condition. According to the AE measurements results, it is possible to aim a defectoscopic checking preferentially to those points where the emission sources were detected. Thus the AE method becomes useful supplement to the common diagnostic methods. This year the measurements continue at two other bridge constructions. The above described measurements, of the bridge 7-012 Brandysek, was carried out in September and October 2002. In 2003, other bridges of different beam types, above all KA, will be examined. The measurement was carried out in the framework of the Ministry of Transport project 803/120/108: Determination of a methodology of ferroconcrete and prestressed constructions reinforcements, GACR project 103/03/0295: Monitoring and analyses of steel reinforcement in ferroconcrete constructions by acoustic emission method: CEZ J22/98:2610007 Theory, reliability and mechanism of constructions failures. Jaeger, J.J., Sansalone, M.J., Poston, R.W. Using impact-echo to assess tendon ducts. In Concrete International, 1997, pp. 42-46. Cullington, D.W., Bradbury, T., Paulson, P.O. Continuous Acoustic Monitoring of Steel Tendons and Cables in Bridges, Bridge Engineering Conference, Guildford, Surrey, UK, April 16 - 19, 2000. 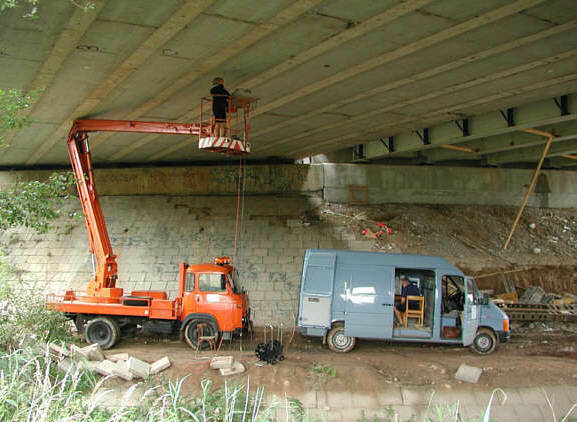 Stryk, J. Pospisil, K. Rebar Corrosion in Concrete Bridges and its Detection by Acoustic Emission Method. In New Trends in Physics II. Brno : VUT-FEI, 2001, pp. 111-116. Korenska, Ma., Pazdera, L., Palkova, M., Korenska, Mo., Ritickova, L., Pospisil, K. Diagnostic of Reinforcement Corrosion within Reinforced Concrete Speciments by Resonant Inspection. In 8th European conference on non-destructive testing 2002, Barcelona, pp. 152, fulltext on CD, 17.- 21.6. 2002.